Golfers Elbow is an overuse injury to the tendon that connects the forearm muscle to the inside of the elbow. It commonly occurs in the 40-60 year old aged group. Golfers elbow is an overuse condition to the forearm flexor which results in pain and discomfort. 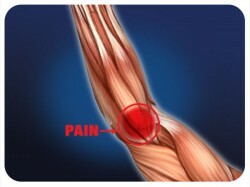 There is usually pain and tenderness on the inside of the elbow just below where the muscles attach to the bone. Some patients may also complain of difficulty picking up or gripping objects. Golfers elbow may also be associated with neck, shoulder or upper back pain and elbow stiffness. Golfers Elbow is a condition that generally occurs due to overuse of the tendon that attaches the forearm muscles to the bone on the inside aspect of the elbow. Some risk factors include repetitive activities, unaccustomed load to the elbow, altered biomechanics or change in equipment. It is commonly seen in sports such as golf, weight-lifting, tennis, squash, badminton, water skiing and gymnastics or activities such as building, painting, bricklaying or sewing. What will a physiotherapist do? The physiotherapist will examine the biomechanics of the patient’s upper limbs and trunk to see if any other areas are contributing to the patients elbow pain. The physiotherapist can employ treatments such as soft tissue therapy, dry needling, electrotherapy, ice or heat, compression garments, joint mobilisation, provide a home exercise program and advice regarding activity modification. The use of an elbow tendon strap or taping the area may also be helpful in assisting recovery. Strengthening exercises can be provided to assist gradually regaining muscle strength in the affected area. If sport is contributing to your elbow pain then relative rest may be required before full return to sport. This may mean that you have to reduce the hours in which you are competing/training for your sport. The physiotherapist may also offer recommendations in change of equipment or technique if they believe it is contributing to your condition. Full return to sport is possible after a thorough rehabilitation process. Reduction of your golfers elbow pain can be seen within several weeks with the assistance of physiotherapy treatment. If treatment is not sought golfers elbow pain can become a more chronic condition, with implications on your ability to work and play sport effectively.